Posted on August 6, 2013 by troy P.
No, IZ is not actually one of “the five” chosen for this week, but I love his take on these two songs, and thought it to be the perfect tie-in between last week’s post and this. Give it a listen. I’ll wait. So, week two in the 00’s (and to my knowledge, still no clear consensus as to how to pronounce that). The end of the decade found my musical knowledge reawakening somewhat, but this time not of my own accord. No, these new ear worms came from (3) primary sources, all of whom were nonexistent in my life previous to this decade. So now we’re here. And tomorrow beckons. Will I be on-board? Most likely not. But that’s OK. I had my time, and my time was good. Tomorrow beckons as it always did, for the young people to stand up and have their voices heard. Voices that they are only now learning how to create. My prayer is that they will be more influenced by folks like The Clash and Public Enemy, Matisyahu and Macklemore, then they are by the Disney Machine. They’ve the power to do either, and only time will tell. 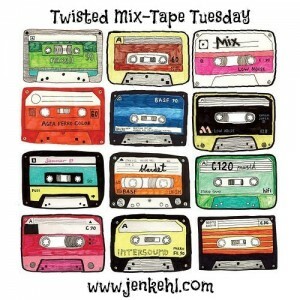 Another Tuesday, another Twisted Mix-Tape. This one rounding out our stroll through the decades. I’d like to thank Jen for pushing me into dredging up these musical memories, and I hope you enjoyed them as much as I.
Oh, and before we leave the decade, let’s take just a moment to celebrate the rebirth of Rick, through the 00 introduction of the “mash-up.” I knew you’d do it, Mr. Astley. I mean, after all, you DID say that you would never let me down, right? This entry was posted in as long as i'm blogging, as long as i'm growing, as long as i'm ruminating, as long as i'm singing and tagged growing up, macklemore, Matisyahu, Matt And Kim, memories, mix tape, music, new life, Paul Weller, Pink, reflections, the 00′s, Twisted Mix Tape Tuesday, writing prompts by troy P.. Bookmark the permalink. P!nk is one of my favorite artists, I feel such a connection with her and her words. I liked all your selections, enjoyed giving them a listen (and RICK ASTLEY, oh how I love that man and his pop hit SUGAR) but I was so pleased to find P!nk on this list, with that song. I adore P!nk, and that song particularly. Matis, Matt & Kim, and Nirvana in the same post! Did we just become best friends?! If you also have a love of Converse Allstars, you betcha! Well consider it a done deal! Gotta rock the Chucks! Yay! I love Chuck lovers! I listened to this last night….perfect T! one of my faves courtesy of a friend. I LOVE that song by IZ. I remember the first time I heard it, I went home after purchasing it and immediately played it over and over and over again to figure out the transition and whether the two songs did indeed have the same melody. Also, haven’t heard of Matt and Kim before but I’m totally digging that song! Thank you. I still feel that way about the song, even if my idea of Life and Love have been totally altered and matured since then. Those mash-ups are so awesome. Sometimes I’m listening to a song and I hear another song inside it and I think this would make a great mashup but to be able to use the technology “in my spare time” to do it? Not ever. I love this list, it would make a great mix in real life! Thanks Jen – being out of my element so to speak this week, I doubled back on the mix to ensure that the flow was correct (ALL about the flow…) I’m so glad that it played well to your ear as well! Wow, what a list. Lots of new-to-me stuff this week. When I listened to Daylight, I knew I’d heard it somewhere, but something wasn’t quite right about it. Figured it out…they used it in the Sims. That track in particular is extremely important to me. It was introduced to me by my friend Beth. A woman who has given me more support, advice and love in these past few years than a certain other who claimed to love me more or know me better did. Don’t tell Beth this, but this song (along with “Mr Blue Sky” from ELO), will always be the song I think of when I think of her. You always crack me up (and that’s a good thing). I love how you create a list that is so unlike any other. Well Done!!! I’ve only seen snippets of the Grammy gig, but I’ll check it out all the way through now – thanks! You surprised me with Daylight and Try…not in a bad way, but in a “wow, t’s tastes are really interesting” way. So I’m driving in my car this afternoon, clicking through the the presets and I hear “Mom, I touched the net”… lol damn life imitates art again!! ‘I know that song!’ I proceeded to yell at the dashboard. It’s crazy how many doors it’s opened, and how many windows it’s closed! It can end relationships while at the same time starting them anew. Crazy man, just crazy. My youngest is a HUGE Thrift Shop fan, while at the same time I was listening to Same Love. So together we decided to check out their other stuff, and by far, we felt Wings was their best effort to date. I put this post on the backburner until I had enough time to listen with ease. My favourites are IZ–what a voice, like crystal–pure and beyond compare Then there’s Rick and PINK. My daughter introduced me to her. She’s awesome and sooo talented. BTW, it’s wonderful to “see” you again! Even this old chook has P!nk on her playlists.